ABCDchicago: NYE feat. the BILZ and Kashif Live! NYE feat. 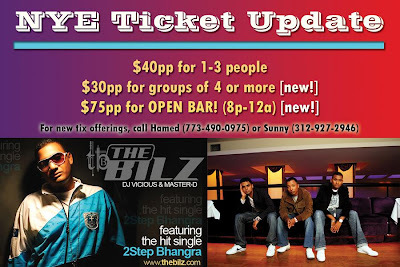 the BILZ and Kashif Live! Special guests, THE BILZ feat. Kashif performing their hits, "Spanish Fly" & "2 STEP BHANGRA" LIVE! THE BILZ & Kashif were nominated for their international smash single, 2 Step Bhangra in 2 major categories at the Bollywood Music Awards 2007. Awarded BEST POP SINGLE & BEST DANCE VIDEO OF THE YEAR. DJ Vicious of THE BILZ / Montreal's Finest Bhangra DJ! 21 to enter. No gym shoes. Dressy jeans acceptable. Call Hamed at 773-490-0975 or Sunny at 312-927-2946 w/ party inquiries.